Welcome to our Guest House;a small independent family run business and a comfortable and friendly place to stay whilst visiting the North West Highlands. 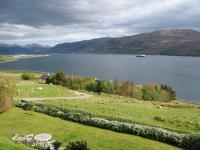 Ardvreck House has been awarded a Four-Star Visit Scotland grading. Situated roughly one and a half miles North of the fishing village of Ullapool in the North West Highlands, following along the route of the NC500;Ardvreck House enjoys spectacular views of Loch Broom, Ullapool and the surrounding mountains from a secluded location on the hillside;the perfect base for relaxing after exploring all that the local area has to offer. A short drive or a stunning walk along the beach will take you in to the village where several good eating places can be found as well as local tourist attractions and the ferry port which will take you twice daily to Stornoway. We have a mixture of twin, family, double and single rooms;most of which have fabulous sea views. We try when possible to accommodate our guests staying for more than one night in one of our Loch facing rooms. All rooms have en-suite shower rooms, flat screen TV's, tea/coffee making facilities and complimentary bottled water, biscuits and chocolates. Wi-fi is available throughout the house. Breakfast is included in the room rate and is enjoyed in our dining room which sits at a raised location towards the front of the house offering panoramic views of the Loch and mountains. The guest lounge which again sits at a raised location towards the front of the house is available for your enjoyment 24 hours a day;a selection of board games, books and binoculars are provided for your use - hot drinks can be purchased between the hours of 3pm and 6pm. 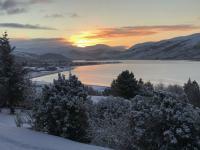 Ullapool lends itself well as a base for exploring the area in all directions. The drive between Ullapool and Durness on the North Coast is stunning, with many interesting stops along the way including Ardvreck Castle (from which we take our name) and Knockan Crag Geology Centre. Other trips include the Summer Isles, Falls of Shin and Gairloch;each room has a detailed Welcome folder with plenty of information in regard to what to see and do in the local area, including walks, car trips and tourist attractions. Ullapool itself was founded in 1788 as a Herring Port by the British Fisheries Society;the harbour is still a bustling place today. Fishing boats, sailing boats, ferries and even the occasional cruise ship come and go. 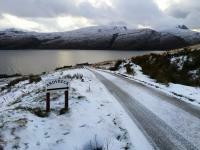 We hope that you enjoy your stay with us here at Ardvreck House.